Each month, FocusEconomics surveys over 900 economic experts from the leading banks, think tanks and consultancies to obtain their projections for the main economic indicators for 127 countries worldwide. The annual FocusEconomics Analyst Forecast Awards recognizes the analysts whose forecasts for a given period turned out to be the most accurate. 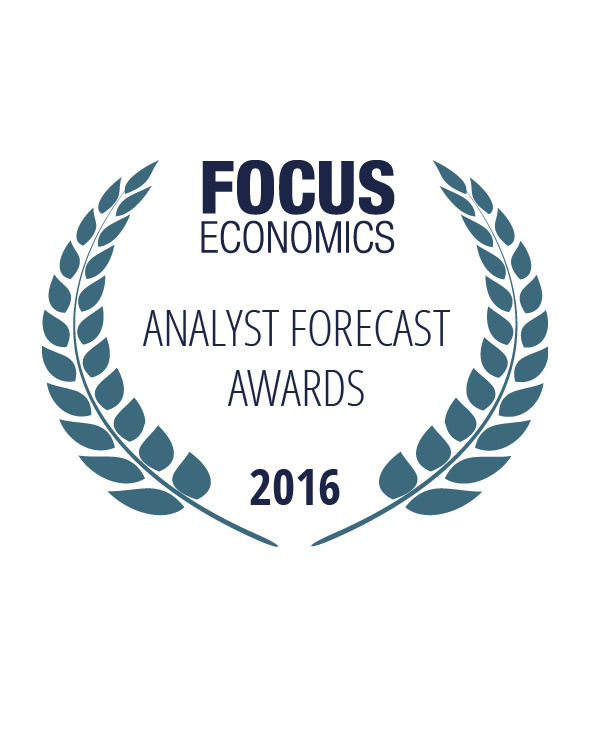 The 2016 Analyst Forecast Awards recognize top economists for their forecasts submitted in 2015 to the FocusEconomics Consensus Forecast Survey. The forecasts (and awards) comprise seven macroeconomic economic indicators (and categories). This year, seven wiiw Economists were recognized by altogether 13 awards. Among them, Rumen Dobrinsky, wiiw Senior Research Associate and Country Expert for Belarus and Bulgaria was even honoured with six awards. Olga Pinduyk’s projections of the policy rate in Kazakhstan even turned out to be the best among all forecasters. 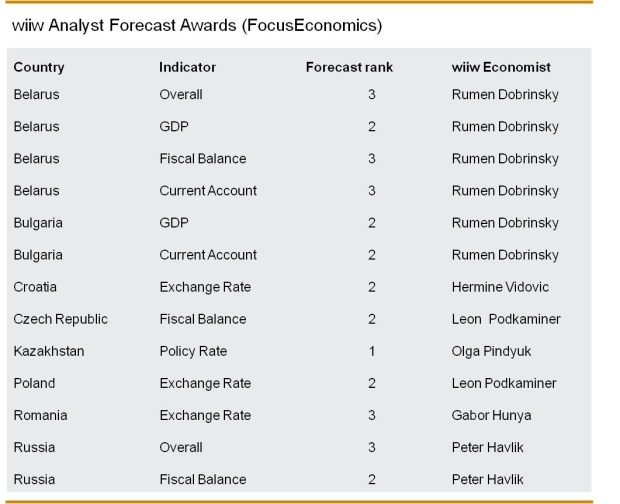 Among the forecasters for Central and Eastern Europe, only JPMorgan, Capital Economics and BM Research received more awards than wiiw. In comparison, the Economist Intelligence Unit (EIU), Goldman Sachs and Oxford Economics received significantly less. 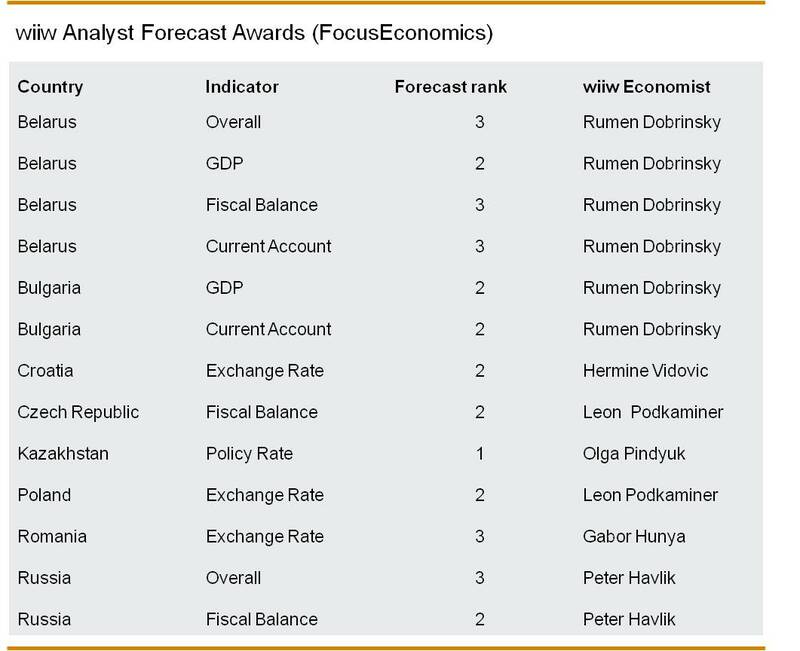 The ranking places wiiw Economists among the leading forecasters for Central and Eastern Europe.